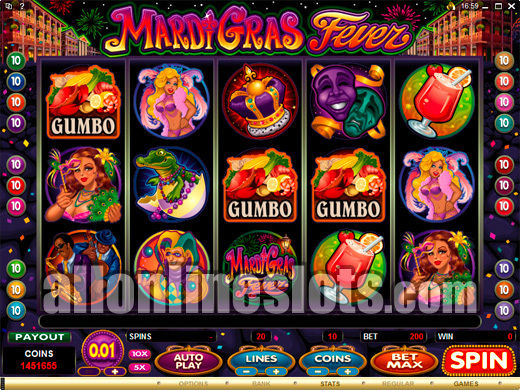 Mardi Gras Fever is a Microgaming video slot with a New Orleans mardi gras theme. It has two bonus features with both free spins and a pick a box bonus game. Top line win during normal play is 2,000 coins and max bet is 10 coins per line. 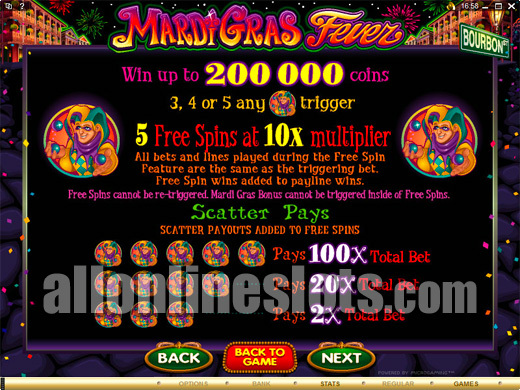 Mardi Gras Fever is a five reel, twenty line video slot developed by Microgaming. They have done a great job of capturing the theme with really rich graphics and a musical soundtrack. The game also has a free spin bonus with the highest multiplier we have seen online. The top line win during regular play is 2,000 coins (20,000 at max bet) which might seem a little low but this is due to the free spins bonus which we will discuss below. 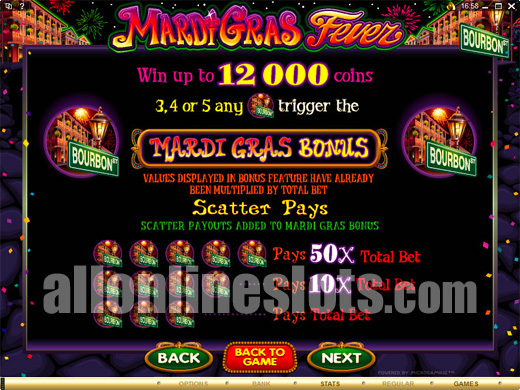 To hit this jackpot you need to line up five Mardi Gras Fever logos on any active line. The five scattered jesters which awards 100 times your total bet which also comes to 20,000 coins if you are playing ten coins per line. Getting three or more scattered jesters gives you the free spin bonus. You get 5 free games with all wins multiplied by 10 making the top jackpot grow to 200,000 coins. The Bourbon St symbols are also scatter pays. 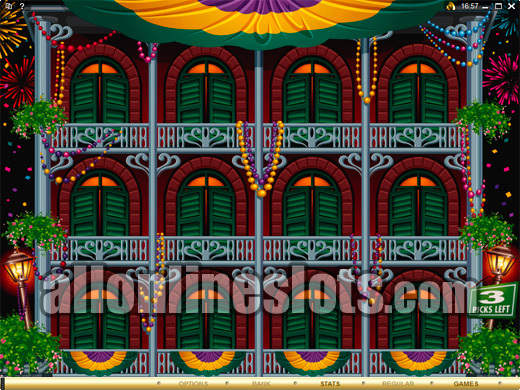 Get three, four or five and you move on to the Mardi Gras Bonus stage where you can win up to 12,000 coins. Here you are shown 12 windows (Screenshot). You get to pick three with each pick revealing a random win of up to 4,000 coins. Back on the reels and you have quite a few good mid level pays including 1000 for five girls, 800 for five crowns and 700 for five pink girls. All of these wins are multiplied by your line bet as you have the option of betting between one and ten coins per line. This makes for a 200 coin maximum bet. 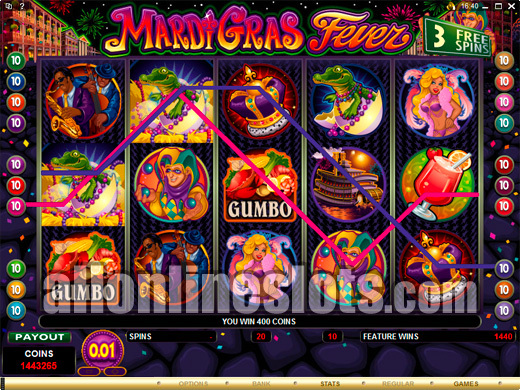 Overall, Microgaming have done a great job bringing the Mardi Gras theme to a slot machine. If you have ever been to Mardi Gras then this game is a must play. Even if you have never been to New Orleans it is well worth a look as the two bonus features make it a fun game to play.